Color! You won’t be seeing a sea of black in the stores. Think red! This color is showing up in sweaters, taping on jeans, taping on joggers. Other strong colors are blue, green, navy and the colors of the rainbow– not just on clothes. Rainbow colors are also showing up in jewelry, especially rings and necklaces. 2. Let’s talk about taping….the athletic inspiration is everywhere. On pants, tops and jackets. 3. The menswear influence is also trending. Plaid pants, leggings and skirts are trending. 4. Another trend is anything with stars! Stars are showing up on sweaters, sweatshirts and joggers. 5. Camouflage is the one craze still continuing. 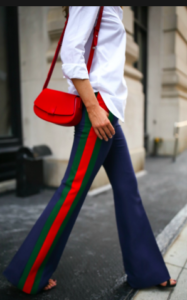 It’s become a strong head-to-toe staple in everyone’s closet. 6. 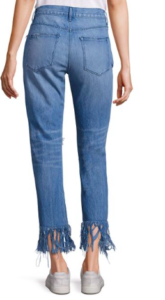 Jeans are still important with a focus on hem details. 7. 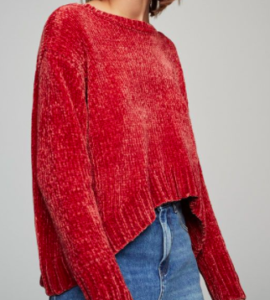 Chenille has returned in the form of sweaters. 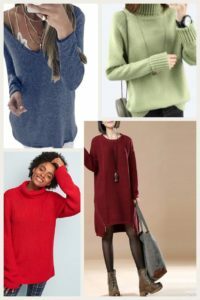 Chunky sweaters in pinks, lavender, navy, red and green. 8. 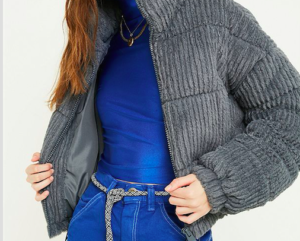 Cozy and easy bear jackets are a must have. Throw these over sweats or jeans as an alternative to a coat. 9. 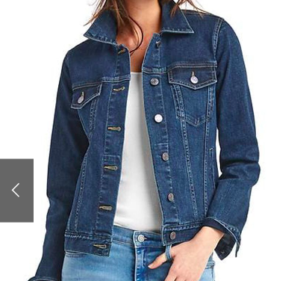 Denim jackets and leather moto jackets are still a fall must have.